In our culture, the Bible is monolithic: It is a collection of books that has been unchanged and unchallenged since the earliest days of the Christian church. The idea of the Bible as "Holy Scripture," a non-negotiable authority straight from God, has prevailed in Western society for some time. And while it provides a firm foundation for centuries of Christian teaching, it denies the depth, variety, and richness of this fascinating text. In A History of the Bible, John Barton argues that the Bible is not a prescription to a complete, fixed religious system, but rather a product of a long and intriguing process, which has inspired Judaism and Christianity, but still does not describe the whole of either religion. 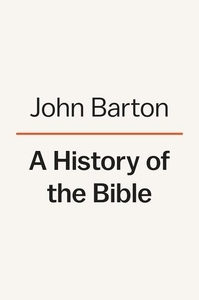 Barton shows how the Bible is indeed an important source of religious insight for Jews and Christians alike, yet argues that it must be read in its historical context--from its beginnings in myth and folklore to its many interpretations throughout the centuries. It is a book full of narratives, laws, proverbs, prophecies, poems, and letters, each with their own character and origin stories. Barton explains how and by whom these disparate pieces were written, how they were canonized (and which ones weren't), and how they were assembled, disseminated, and interpreted around the world--and, importantly, to what effect. Ultimately, A History of the Bible argues that a thorough understanding of the history and context of its writing encourages religious communities to move away from the Bible's literal wording--which is impossible to determine--and focus instead on the broader meanings of scripture.